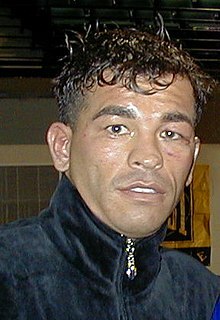 Arturo Gatti (April 15, 1972 – July 11, 2009) was an Italian Canadian professional boxer who competed from 1991 to 2007. Nicknamed "Thunder," Gatti was known for his heart and bravery in the ring, and also carried formidable punching power. A weight class is a measurement weight range for boxers. The lower limit of a weight class is equal to the upper weight limit of the class below it. The top class, with no upper limit, is called heavyweight in professional boxing and super heavyweight in amateur boxing. A boxing match is usually scheduled for a fixed weight class, and each boxer's weight must not exceed the upper limit. Although professional boxers may fight above their weight class, an amateur boxer's weight must not fall below the lower limit. A nonstandard weight limit is called a catchweight. Cassino['kas'sino] is a comune in the province of Frosinone, central Italy, at the southern end of the region of Lazio, the last City of the Latin Valley. Super featherweight, also known as junior lightweight, is a weight division in professional boxing, contested between 126 pounds (57 kg) and 130 pounds (59 kg). Angel Manfredy is a Puerto Rican-American former boxer who has fought in the Junior Welterweight, Lightweight and Junior Lightweight divisions. Angel Manfredy was a popular fighter in the late 1990s. Zabdiel Judah is an American professional boxer. He is a multiple-time former world champion in two weight classes, having held the IBF and WBO junior welterweight titles between 2000 and 2004; the IBF junior welterweight title again in 2011; and the undisputed welterweight title in 2005, which included a reign as the lineal champion from 2005 to 2006. James Leija, best known as Jesse James Leija, is an American former professional boxer who competed from 1988 to 2005. He held the WBC super featherweight title in 1994, and challenged twice each for world titles at lightweight and light welterweight. Richard John Hatton, is a British former professional boxer who competed between 1997 and 2012, and has since worked as a boxing promoter and trainer. During his boxing career he held multiple world championships at light-welterweight and one at welterweight. Hatton is ranked by BoxRec as the best British light-welterweight of all time, the third best in Europe, and eleventh best worldwide. In 2005 he was named Fighter of the Year by The Ring magazine, the Boxing Writers Association of America, and ESPN. Ivan Vivian Harris is a Guyanese professional boxer who held the WBA super lightweight title from 2002 to 2005. Emanuel Augustus, is an American former professional boxer out of Brownsville, Texas, who competed from the 1990s to 2011, known for his entertaining boxing style, and showboating manner in the ring. He faced top level competition throughout his career, winning the IBA light welterweight title in 2004. 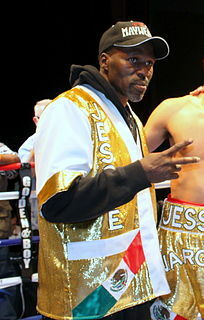 Ivan "Mighty" Robinson is a boxer who has compiled a record of 36-12-2 since becoming a professional in 1992. He attended Simon Gratz High School. Andre Michael Berto is a professional boxer who holds dual American and Haitian citizenship. He is a two-time former welterweight world champion, having held the WBC and IBF titles between 2008 and 2011, as well as the WBA interim title in 2015. As an amateur he won the National Golden Gloves tournament in 2001 and 2003 (welterweight), and would represent the U.S. at the 2003 World Championships, winning a welterweight bronze medal. He also represented Haiti at the 2004 Olympics, reaching the opening round of the welterweight bracket. Carlos Manuel Baldomir is an Argentine former professional boxer who competed from 1993 to 2014. He held the WBC, Ring magazine, and lineal welterweight titles in 2006, and challenged once for the WBC super welterweight title in 2007. Roger Mayweather is an American former professional boxer who competed from 1981 to 1999, and has since worked as a boxing trainer. He is a two-weight world champion, having held the WBA and lineal super featherweight titles from 1983 to 1984, and the WBC light welterweight title from 1987 to 1989. Additionally he held the IBO light welterweight title in 1994, and the IBO welterweight title from 1994 to 1995. Joey Gamache is an American former professional boxer who held the WBA super featherweight and lightweight titles. Victor Ortiz is an American professional boxer and film actor. He held the WBC welterweight title in 2011, and was formerly rated as one of the world's top three active welterweights by most sporting news and boxing websites, including The Ring magazine, BoxRec, and ESPN. His crowd-pleasing and aggressive fighting style also made him the 2008 ESPN Prospect of the Year. Richard Eklund Jr. is an American former professional boxer in the welterweight division. A former New England Welterweight Champion, Eklund was known as "The Pride of Lowell". He is the half-brother and former trainer of former WBU World Champion Micky Ward. The 2010 biopic The Fighter is based on the two brothers' fall and rise to the boxing title. Marcos René Maidana is an Argentine former professional boxer who competed from 2004 to 2014. He was a world champion in two weight classes, having held the WBA (Regular) super lightweight title from 2011 to 2012, and the WBA welterweight title from 2013 to 2014. A versatile brawler in the ring, Maidana was well known for his formidable punching power, and was never stopped in any of his five losses. 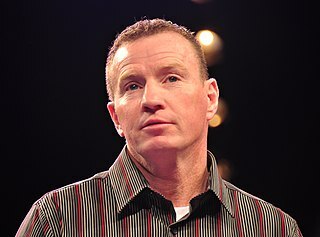 George Michael Ward Jr., often known by his nickname of "Irish" Micky Ward, is an American former professional boxer who competed from 1985 to 2003. He challenged once for the IBF light welterweight title in 1997, and held the WBU light welterweight title in 2000. Ward is widely known for his trilogy of fights with Arturo Gatti, two of which received Fight of the Year awards by The Ring magazine, as well as his relentless pressure fighting style. In the 2010 film The Fighter, based on his early career, Ward was portrayed by Mark Wahlberg. Arturo Gatti vs. Floyd Mayweather Jr., billed as "Thunder & Lightning", was a professional boxing match contested on June 25, 2005 for the WBC super lightweight championship. 1 2 "Canadian former boxing champion Gatti found dead in Brazil". TSN . July 11, 2009. ↑ "Canadian former boxing champion Gatti found dead in Brazil". CTV News Channel . July 11, 2009. 1 2 "Boxer Arturo Gatti found dead". CBC News . July 11, 2009. ↑ "Arturo Gatti inducted into Boxing Hall of Fame". QMI Agency. December 11, 2012. ↑ Pothier, Jacques (Feb 2011). Éditions La Presse, ed. Arturo Gatti : Le dernier round (in French). Montreal. ISBN 978-2-923681-52-8. OCLC 701590105. ↑ "Arturo Gatti considering return to the ring". The Canadian Press . September 24, 2008. Archived from the original on 2014-03-01. Retrieved 2017-12-07. 1 2 "Foul play suspected in Gatti's death". ESPN . July 11, 2009. ↑ "Hard-hitting Arturo Gatti was one of Canada's boxing greats". The Canadian Press . July 11, 2009. 1 2 3 4 5 6 "Arturo Gatti". Pro Boxing Fans. Retrieved June 28, 2018. 1 2 3 "The Time Machine: Arturo Gatti vs. Wilson Rodriguez". The Ring. March 23, 2013. Retrieved June 28, 2018. ↑ Curran, John (February 23, 1997). "Gatti beats Patterson again". Associated Press . Retrieved June 28, 2018. ↑ Smith, Timothy W. (February 23, 1997). "Gatti Leaves Little Doubt In Rematch With Patterson". The New York Times . Retrieved June 28, 2018. 1 2 Christ, Scott (July 13, 2009). "Arturo Gatti: The Career, The Fights, The Blood, The Legacy". Bad Left Hook. Retrieved June 28, 2018. ↑ McRae, Kevin (December 10, 2012). "Arturo Gatti's Hall of Fame Call Is a Great Thing for Boxing". Bleacher Report . Retrieved June 28, 2018. ↑ Smith, Timothy W. (December 14, 1998). "BOXING: IN THE NEWS -- LIGHTWEIGHT; Gatti Revels in the Punishment". The New York Times. Retrieved June 28, 2018. ↑ "Boxer suing Gatti". AP . March 3, 2006. ↑ Spousta, Tom (March 25, 2001). "BOXING; Savvy De La Hoya Stops Gatti With Technical Knockout". The New York Times. Retrieved June 28, 2018. ↑ Raskin, Eric (May 18, 2012). "Gatti-Ward I: 'Fight of the Century'". Grantland . Retrieved June 28, 2018. ↑ Nile, Levi (May 18, 2014). "Arturo Gatti vs. Micky Ward I: Remembering the FOTY for 2002". Bleacher Report. Retrieved June 28, 2018. ↑ Gray, Geoffrey (June 8, 2003). "BOXING; Gatti Wins Last Round of Intense Feud". The New York Times. Retrieved June 28, 2018. ↑ Argeris, Steve (June 9, 2003). "Gatti Mulls Next Move, While Ward Calls It Quits". The Washington Post . Retrieved June 28, 2018. ↑ "Gatti vs. Ward Trilogy - CompuBox By The Numbers". Boxing Scene. October 20, 2013. Retrieved June 28, 2018. ↑ "HBO: Boxing: Ward vs. Gatti I highlights from the best fights of the decade on HBO.com". HBO. Retrieved 2017-06-30. ↑ "Gatti overcomes hand injury, beats Branco". ESPN. January 24, 2004. Retrieved June 28, 2018. ↑ "Gatti Wins Latest Battle and a Title". Los Angeles Times . January 25, 2004. Retrieved June 28, 2018. ↑ Gray, Geoffrey (January 26, 2004). "BOXING; Humbled by Tough Fight, Gatti Is Champ Nonetheless". The New York Times. Retrieved June 28, 2018. ↑ "BOXING; After Showing Polish, Gatti Has Eyes on Mayweather". The New York Times. July 26, 2004. Retrieved June 28, 2018. ↑ Indri, Mike (January 30, 2005). "Gatti crushes Leija in 5th round knockout – is Mayweather next?". Boxing247.com. Retrieved June 28, 2018. ↑ Brown, Clifton (June 26, 2005). "Gatti Is No Match for Mayweather". The New York Times. Retrieved June 28, 2018. ↑ Greenberg, Jay (January 29, 2006). "GATTI: THE WEIGHT'S OK". New York Post . Retrieved June 28, 2018. ↑ Rafael, Dan (July 22, 2006). "Power of Baldomir quashes 'Thunder'". ESPN. Retrieved June 28, 2018. ↑ Rafael, Dan (April 29, 2007). "Former foes Gatti, Ward to share a corner". ESPN. Retrieved June 28, 2018. ↑ "Gatti Retires After Beating by Gomez". The Washington Post. July 15, 2007. Retrieved June 28, 2018. ↑ Fowle, Noah (July 15, 2007). "Gatti KO'd for career". New York Post . Retrieved June 28, 2018. ↑ "De La Hoya blog: The best I fought". The Ring. August 19, 2009. Retrieved June 24, 2018. ↑ "Montreal boxer Arturo Gatti mourned as legend". The Gazette . July 12, 2009. Archived from the original on July 14, 2009. ↑ "Lutador de boxe canadense é achado morto em flat em Porto de Galinhas, em Pernambuco" (in Portuguese). O Globo . July 11, 2009. ↑ Emert, Harold; Abramson, Mitch; Goldsmith, Samuel (July 12, 2009). "Wife of Gatti Charged With Murder". Daily News . ↑ "Police quiz wife of boxer Gatti". BBC News . July 12, 2009. ↑ "Arturo Gatti's death ruled a suicide by Brazilian police". NJ.com. July 30, 2009. Retrieved 2015-09-29. ↑ "Brazil police rule Gatti's death suicide". Associated Press. July 30, 2009. ↑ "Boxer Gatti's death ruled suicide". BBC News. July 30, 2009. Retrieved March 31, 2010. 1 2 3 4 Boxing Champ Gatti's Death Remains a Mystery. NY Daily News. March 2010. ↑ "Gatti death circumstances uncertain, Quebec coroner says". CBC news. 2011-11-09. Retrieved 2015-09-29. ↑ Arturo Gatti - Toe To Toe Archived May 15, 2010, at the Wayback Machine JB Hi-fi. Retrieved May 30, 2010. ↑ "Wedding Day Funeral". Murder in Paradise. Investigation Discovery. April 2013. Wikimedia Commons has media related to Arturo Gatti .